Looking for a particular Deployment? Kalmbach Publishing Co/Airlife Publishing Ltd.
* Of course CONUS based units and aircraft started deploying to Europe well before 1970. Maybe at a later date I will start to include the 1960’s deployments. If anyone has any information concerning these, I would be interested in hearing from you. A brief introduction to some of the names and operations mentioned throughout this article follows. In 1968 the United States needed to reduce their forces stationed in Europe. An agreement was made with the UK and Germany that allowed the United States to remove 35,000 troops and 96 aircraft back to CONUS (CONtinental United States) but for them to return annually to Europe to exercise. The US Army portion of this was named REFORGER (the REturn of FORces to GERmany), while the USAF portion was called 'Crested Cap' (originally named ‘Heavy Draw’). ‘Crested Cap’ represented a plan to return four complete fighter squadrons (These were the 49 TFW’s 7th,8th & .9th TFS at Spangdahlem and the 417 TFS at Hahn) to the United States. Squadrons brought back to the United States were still aligned with their bases in Germany. These units were known as 'dual-based squadrons'. The first ‘Crested Cap’ took place between 15 January – 4 April 1969 when the entire 49th TFW deployed from Holloman AFB back to Spangdahlem AB. In 1977 the wing ceased its "dual-base" commitment to NATO and changed to an air superiority mission and were replaced by the 4th TFW. 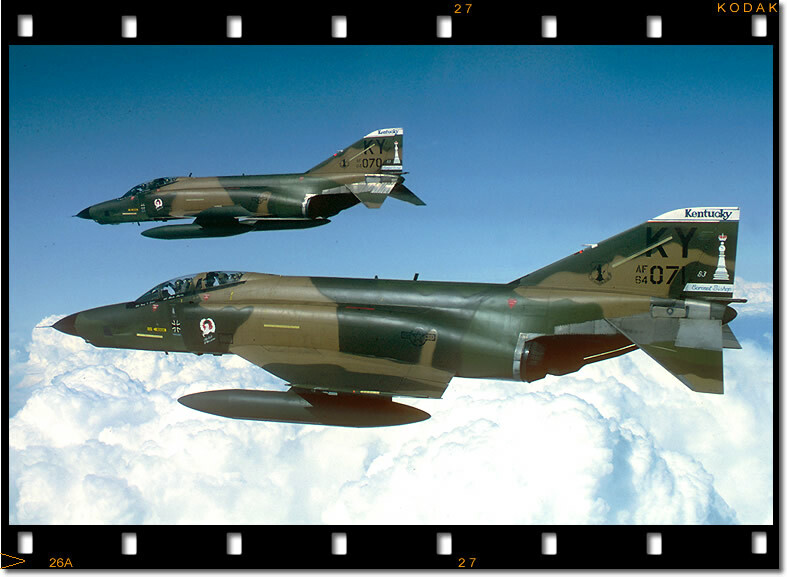 Initiated in 1975 the ‘Coronet’ series of deployments brought TAC, ANG and AFRES Fighter units to Europe for two-week periods (sometimes shorter or longer) to exercise their long range deployment capabilities and to familiarize themselves with the European theatre of operations (and weather!). From 1979 the ‘Coronets’ came under the ‘Checkered Flag’ programme, which required the units to deploy once every three years. 'Checkered Flag' was initiated to provide realistic deployment training and was terminated in 1997. When the units deployed to Europe they CHOP (CHange of OPerational control) at 10 degrees W. longitude. They then came under the command of the U.S. commander at EUCOM (EUropean COMmand). Starting in 1972, the 67th and 363rd TRWs began deploying annually to Europe for two-week exercises under the Creek Bee programme (1972-74) and from 1977 to 1989 under the programme ‘Salty Bee’ These deployments rotated annually (with a couple of exceptions) between Aviano AB, Italy, Zweibrücken AB, Germany and RAF Alconbury, United Kingdom. With the inactivation of the NAS Keflavik based 57th FS on 1 March 1995, the air intercept mission at Iceland was taken over by ACC and ANG fighter units on a 90 day rotational basis. This is a still ongoing operation. No explanation of this is probably needed. Obviously these operations mainly occurred outside Europe and therefore are excluded from this article, but a few aircraft/units did deploy to Europe in association with this operation and are included. This was a Combined Task Force (CTF) charged with enforcing the no-fly zone north of the 36th parallel in Iraq and monitoring Iraqi compliance with UN Security Council resolutions 678, 687, and 688. ACC, ANG & AFRC Fighter units deployed on 45/90 day rotational deployments to Incirlik AB, Turkey. Joint UN/NATO Operations to enforce a no-fly zone over Bosnia-Herzegovina. ACC, ANG & AFRC Fighters deployed to Aviano AB, Italy on rotational basis. These operations eventually lead to Allied Force/Operation Noble Anvil (see below). Operation Allied Force was a NATO contingency response aiming at ensuring full compliance with UN Security Council Resolution 1199 (Sept. 23rd 1998). Operation Noble Anvil was the American component of this NATO action to promote regional stability, cooperation and security, in support of the international community. ACC and ANG Fighter (along with USAFE) units deployed to bases in Italy, Hungary, Turkey and Germany. Flew combat missions over Federal Republic of Yugoslavia. As a tool to keep their units at the cutting edge competitions have been a feature of the USAF for sometime. Various competitions have been held in Europe and attended by USAF/ANG/AFRES Fighters. These include the NATO ‘Best Focus’ Reconnaissance meets, Tactical Fighter Meets & RAF Bombing Competitions of the 1970’s. Deployment code name assigned, followed by Main exercise the unit took part in, if known (other known exercises will be listed in 'Further Info'). If no name was assigned then 'NOT ASSIGNED' is used, if a name was probably assigned then 'UNKNOWN' is used and finally when it could be either the 'UNKNOWN or NOT ASSIGNED' is used! The main base the deployment deployed to (If known). Followed by Country. On the rare occasions that the deployment moved from base to base then the arrival base will be used. The unit deployed: Wing (Group if applicable) followed by Squadron (If applicable or known). Followed by units home base and major command. (note: Unless noted the Squadron applies to the crews/personnel deployed and not necessary the aircraft, many squadrons deployed with aircraft normally assigned to other squadrons of the wing (especially during the 1970's), a good example of this is the various Crested Cap deployments where say the 8 TFS was the designated deploying squadron but the 24 F-4s comprised 7 TFS, 9 TFS and 417 TFS assigned aircraft. Aircraft type(s) deployed followed by number of aircraft deployed if known. List of known serial numbers of aircraft deployed. Tail stripe colour not known, used only when the majority of others are known. Additional info concerning the deployment and notes applicable to the other sections. Red text is used to denote missing or conflicting info. An article of this size and detail would not have been possible without the generous help of the following gentleman. Each deployment is presented as per the example below. Most of the information is self explanatory, but it is probably in order to give a brief summary of each section. One common feature of many deployments were the EC-135K 'Head Dancer' command posts, which helped 'drag' the fighter deployments to Europe, providing communication links and navigation. 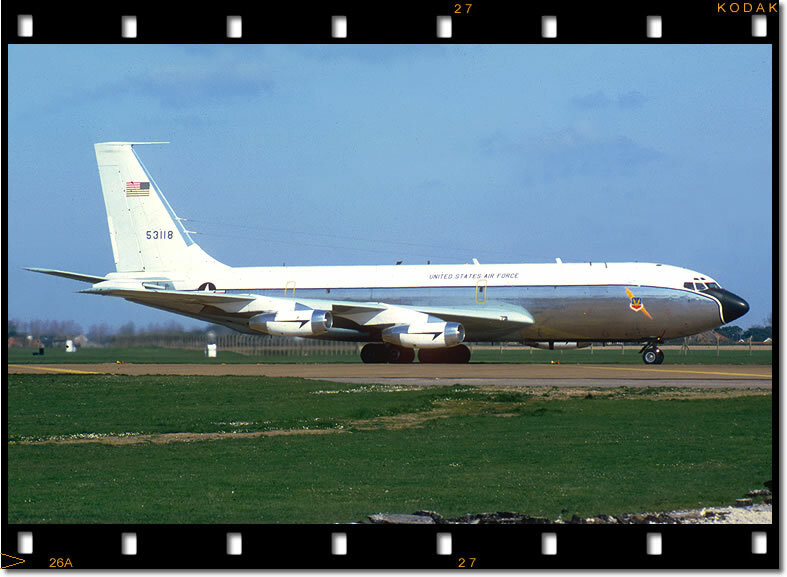 The three EC-135K's, 55-3118 (photographed at RAF Mildenhall,9/4/80), 59-1518 & 62-3536 (w/o 14/9/77) were operated by the 8th Tactical Deployment Control Squadron. They were withdrawn from service in 1996, their duties being taken over by regular KC-135s & KC-10s.